Born in Baghdad, Iraq in 1950, Zaha Hadid was the first woman to win a Pritzker Architecture Prize AND the first woman to win a Royal Gold Medal in her own right. Her work experiments with new spatial concepts and encompasses all fields of design, ranging from urban spaces to products and furniture. At the age of 65, young for any architect, she died suddenly of a heart attack. From parking garages and ski-jumps to vast urban landscapes, Zaha Hadid's works have been called bold, unconventional, and theatrical. Zaha Hadid studied and worked under Rem Koolhaas, and like Koolhaas, she often brings a deconstructivist approach to her designs. Since 1988, Patrik Schumacher had been Hadid's closest design partner. Schumacher is said to have coined the tern parametricism to describe the curvaceous, computer-aided designs of Zaha Hadid Architects. Since Hadid's death, Schumacher is leading the company to fully embrace parametric design in the 21st Century. 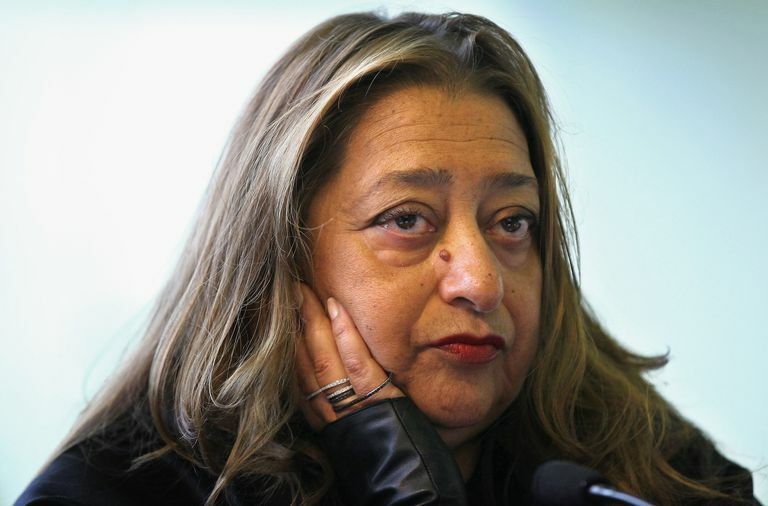 Zaha Hadid is also known for her exhibition designs, stage sets, furniture, paintings, drawings, and shoe designs. In 1979, Zaha Hadid opened her own practice, Zaha Hadid Architects. Patrik Schumacher joined her in 1988. Zaha Hadid was the first woman to win a Pritzker Architecture Prize. Learn more from Citation from the 2004 Pritzker Prize Jury. Do You Know the 3 Rules of Architecture? What Architects Were Born in April? Who is Odile Decq, the Rock 'n Roll Architect? Who are Jacques Herzog and Pierre de Meuron?